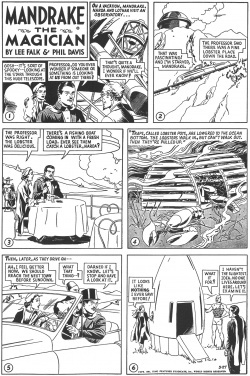 "The Spaceship to Venus" is the 50th Mandrake Sunday story. The story was written by Lee Falk and drawn by Phil Davis. Mandrake, Narda and Lothar are on vacation in a deserted countryside when they finds a strange metal object. When Mandrake and Lothar examines the inside the strange object shoots up into the air, and into a huge space ship and next to a zoo at the planet Venus. At Earth the police thinks Narda, when she told that Mandrake and Lothar have been kidnapped by an alian space ship, invents a crazy alibi on record for murder. Soon she is on trail in connection with the disapperance of Mandrake and Lothar. The jury decided that she was guilty with the murder of Mandrake and Lothar and the judge sentence her to death. Can Mandrake save her, a hundred millions miles from Earth ? At the deepwoods.org index the title for this story is "The Spaceship to Venus", which is lifted from the plot. This page was last edited on 26 March 2019, at 21:11.